The Necchi QS60 is an extraordinary sewing machine built with all types of sewers in mind. Quality craftsmanship, speed, power and precision allow the user to easily handle a variety of sewing projects from garment construction to home decoration to quilting. With top sewing speeds of 1,000 stitches per minute and a generous selection of stitches to choose from serious sewers will find that projects get completed more quickly and look more professionally done. The 63 built-in stitches are listed on a quick reference guide in the lid. Use the push button keys and backlit LCD display screen to choose from the many decorative, utility or 4 different one step buttonhole styles. Stitches can even be customized and saved in the QS60’s memory bank. The QS60 has auto-lock, automatic thread cutter and needle up/down features making piecing quilt blocks simple and easy. Quilters will also appreciate features like a larger 9” X 5” throat space, Even Feed Foot, knee lift, extra-high presser foot lift, and large extension table when working with their quilts. Drop the feed dogs and use the Basting/Darning Foot for free motion stitching. These great features help you to keep both hands on your quilt and maneuver it easily while sewing. This sewing machine has a jam-proof, top-loading bobbin system. The independent motor lets you wind bobbins while the machine is sewing which is a wonderful time saving feature. A Foot Storage compartment comes with the machine to house the many standard feet and accessories keeping your sewing area neat and organized. The Instruction Book is illustrated and easy to read. You’ll enjoy sewing with your Necchi QS60 for years to come. 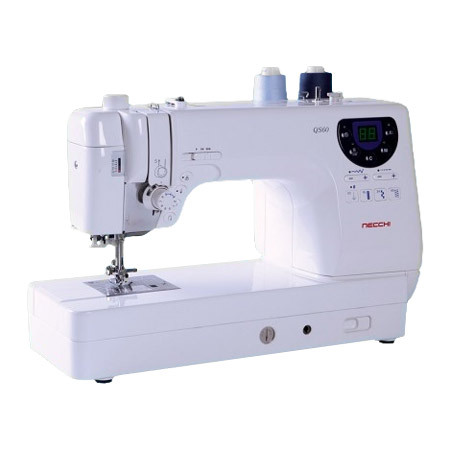 This Necchi QS60 includes seven FREE presser feet - applique, edge guide, gathering, two pintucking, piping and concealed zipper. These are not packed with the machine by Necchi. We are offering them as a promotion, a value to our customers of $114.